I finally cut, bent, and put together the rebar arbor I’ve pictured in my head for the last two years. Last summer it was a single span, this year I doubled it for more stability and wired in a few cross braces. I really should throw a little concrete around the base…. but I’ll wait till it blows over this autumn before I learn that lesson (again). Arbor going into the vegetable garden. The rebar alone looked a little bare, so I went out back and ripped down a few grape vines to bulk it up, and give the vines a little something to hold on to. 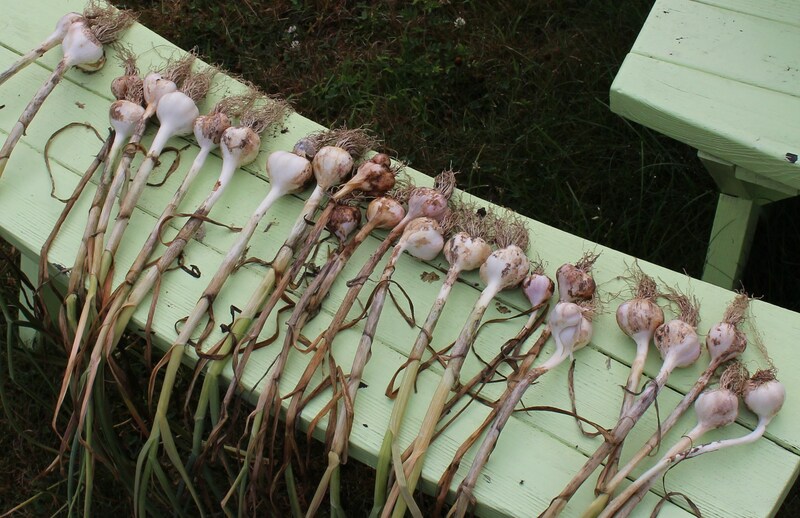 Since we’re in the vegetable garden, here’s the early garlic harvest. This is the first year I managed to plant it properly (in October), and I’m pleased. I’m even more pleased since these were stray, sprouting cloves I found in the bottom of the vegetable crisper which were planted out rather than thrown away. Garlic harvest. The ones I actually bought from the garden center specifically for planting are a later variety and yet to be harvested. Last winter was one of the coldest, snowiest ones I’ve experienced living here, so you can imagine my surprise to find some gladiolus overwintered. I vaguely remember there being a few thin little wisps of gladiolus leaves here last summer (I must have missed some of the tiny cormlets when the mother bulbs were lifted) but never gave them much thought. This year they’re back, and voila, the little things surprised me even more by blooming! Not only was the gladiolus a surprise, but the color coordination with the phlox, verbena and pole bean blooms is better than anything I could plan! I only finished laying out and digging up the vegetable garden last summer, prior to that it was lawn and a holding bed for some of the plants brought up from the old house. One of those plants was a wisteria vine, and when I moved it the remaining roots put up a couple suckers. Surprise again when one of the suckers actually put out a bloom! 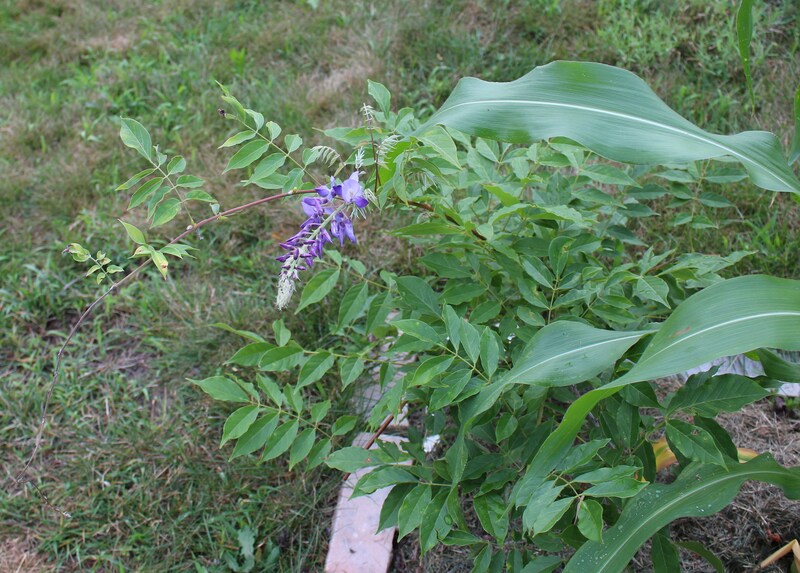 Not many gardeners are avant-garde enough to combine sweet corn with wisteria, and the fact that I’m considering building another arbor or tuteur in order for this guy to stay here says a lot about the haphazard design of my garden. It surprises me that I would actually post a photo of this mess. It’s the unfinished steps to the deck, and it’s were I like to sit with a drink thinking about all the tasks I should be finishing up instead. 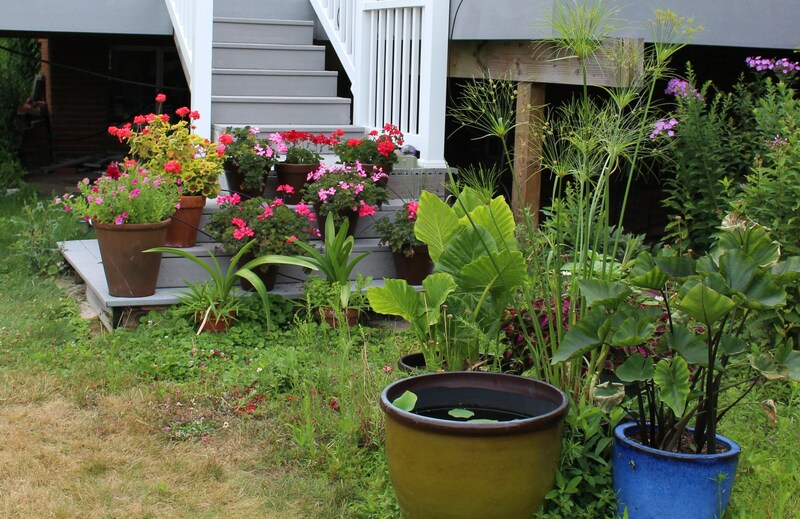 Tropicals in pots, geraniums on the steps, and plenty of weeds. I actually did trim them all back yesterday but I’m sure they’ll have rebounded by the time I take another picture. From the steps I get a good view of the vegetable patch -I like to call it the farm 🙂 , and the sunflower patch. Last week I noticed this quilled version in with the others. The rolled up petals are different enough to be interesting. In the center is the quilled version of the regular sunflowers. The flowers are nice enough, but it’s the coming and going of the goldfinches and sparrows that keeps things busy around here… as well as the angry little hummingbird who tries to chase everyone away. I’m getting the feeling yellow is a little passé as far as being a fashionable color -if it ever was- but I clearly have a problem with “acquiring” yellow leaved plants. 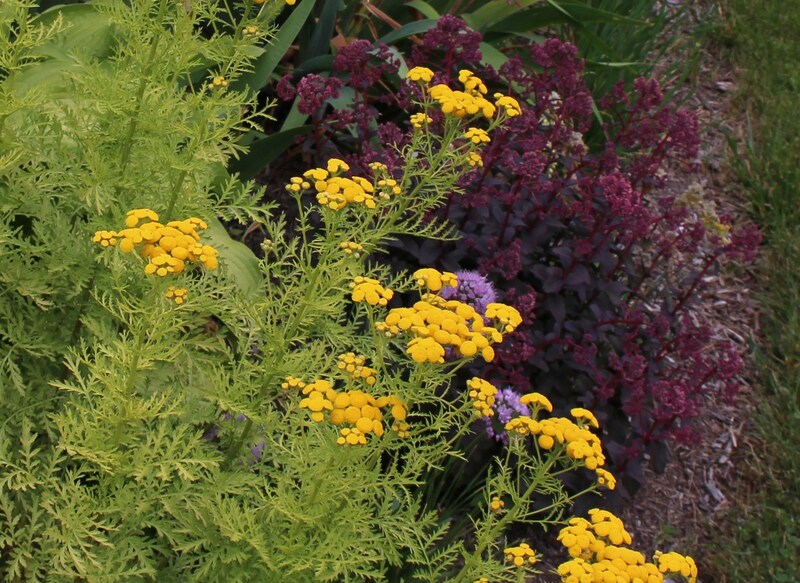 “Isla Gold” Tansy is one of my favorites with its finely cut foliage and drought tolerance. ‘Isla Gold’ Tansy (Tanacetum vulgare) in front of ‘Bon Bon’ sedum. Don’t let the stupid name throw you off, the sedum is also a great plant. Around the house in the front yard I finally gave up on the way-too-dry-and-hard-to-water spot by the lamppost. 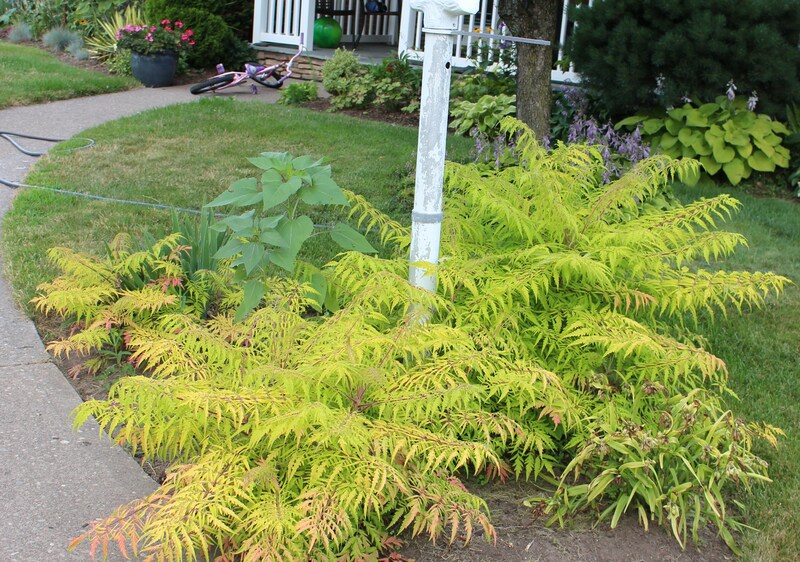 I trimmed the ‘Tiger Eyes’ staghorn sumac back to the ground and let it and its suckers fill in the bed. Too much yellow? I don’t think so, and I no longer have to water this spot. I hope the plant police don’t find me. ‘Tiger Eyes’ cutleaf sumac (Rhus typhina “Bailtiger”) is a patent protected plant, and here it is propagating itself without corporate approval. Another weedy spot has been the front street border. I should probably do something about this since it’s a slightly prominent location which everyone who passes sees… but I’m a little bored with it right now. Maybe once this bright red standing cypress (Ipomopsis rubra) blooms and some of the other annuals take off I’ll like it again. I wish I had some nice mulch for it though. I’m constantly jealous of compost rich gardeners and the ones who flaunt their piles of aged leaf mould, and I think I’m close to breaking down and raiding the yard waste dumped by my neighbors in the nearby woods. I’m sure my mother in law will be horribly embarrassed. More golden yellow in the form of rudbeckias, this time tastefully paired with red standing cypress -which almost has a touch of orange in the blooms. If people complain I’ll remind them the ipomopsis is a southeast native plant and hummingbird friendly, hopefully that will distract them from judging my trailer park color combos too harshly. “Blue Satin” -or maybe ‘Blue Bird’, I forget- rose of sharon (hibiscus syriacus) always looks a little out of place or a little weedy to me, but the color is interesting and it just laughs off drought and abuse. The white variety “Diana” (a sterile variety) still needs to be acquired, I keep forgetting to take a cutting of my mother’s bush in NY. 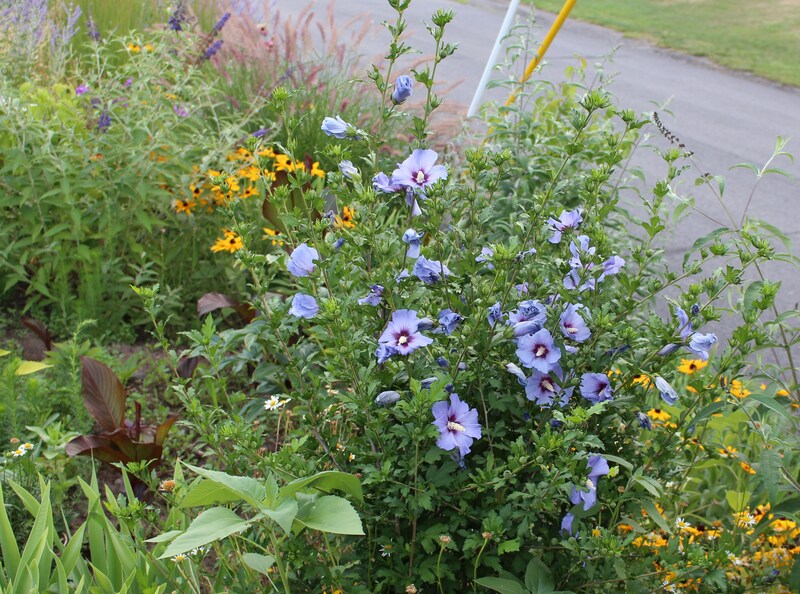 As close to blue as you get in rose of Sharon, “Blue Satin” is a cool color but reseeds freely, and the seedlings though nice enough are all more purplish. 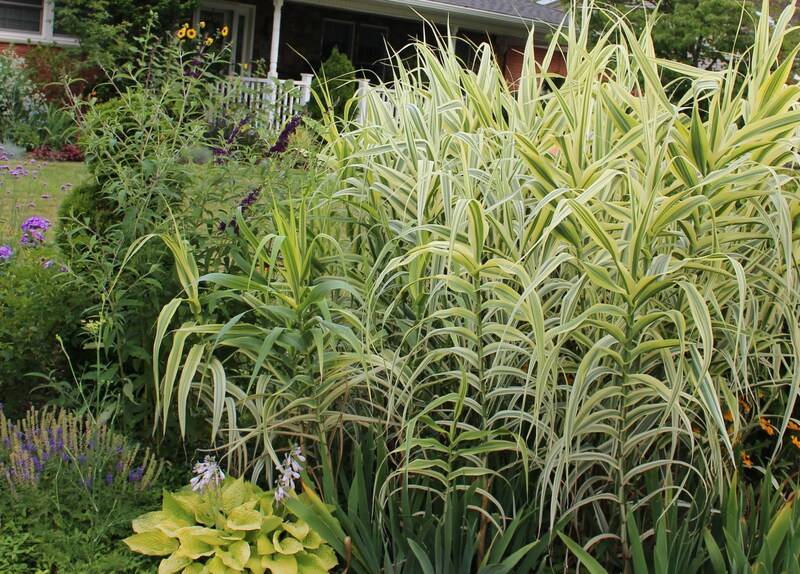 You can’t help but notice the big clump of arundo donax ‘variegata’ (variegated giant reed) growing at the end of the bed. Wow, I love it. It will easily reach 10+ feet by autumn and if frost holds off we’ll even see the seed plumes. This variety will begin the season with a crisp white/green variegation, mellow to yellow around now, and then go green as soon as temperatures peak for the summer. It’s invasive down south, so keep that in mind, but the huge clumps I used to see down in Texas were quite impressive. Still bright, this clump should ‘green out’ in the next few weeks if temps go up… the cool summer has kept it brighter for longer than usual. A few pennisetum “Karley Rose” divisions (also patented, so please don’t tell anyone I split my clump) are still gaining momentum here amongst the black eyed susans. They would have done better without all the company but I just couldn’t rip out the daisies. I’m sure by next year the grass will just muscle it’s way through and form a big clump to hopefully balance out the big hydrangea. Pennesitum ‘Karley Rose’, rudbeckia hirta seedlings, and erynginum in the shadow of the almost blooming ‘Limelight’ hydrangea. I’ll end with a non yellow. 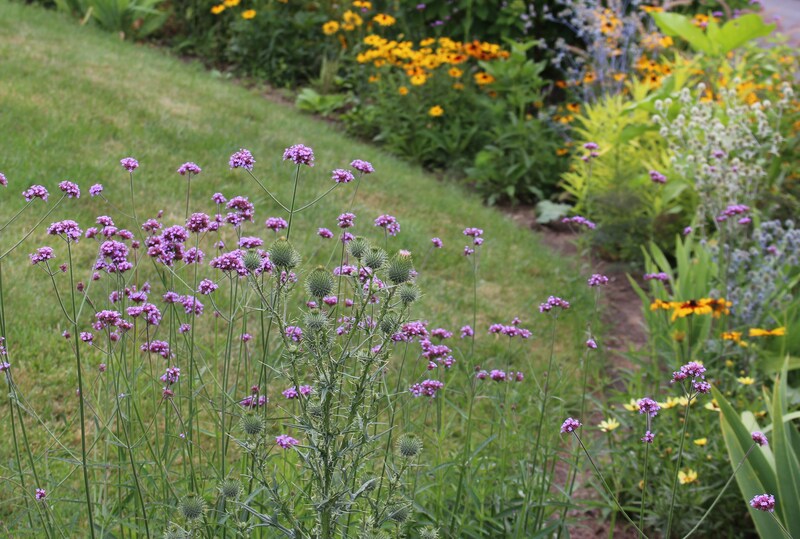 Verbena bonariensis is starting to open up all over the borders and I wish I had more! Serves me right for having ripped so much out this spring. Finally something to balance out all the yellow, but is that a prickly thistle coming up through the middle of the clump!? Who missed that weed? You might notice in the last picture that there’s a mild green tint to the lawn. I’m afraid I’ve gone over to the dark side, and have begun to water the lawn. The brown straw mat I looked at all last July and August was just too depressing, and if I can just get it to the next thunderstorm (tonight I hope), things should stay green for at least another week or two. Honestly I only ran the sprinkler one day, and the back lawn is responsibly dead….. but I may or may not have also fertilized the day before I watered…. sometimes even good people stray. 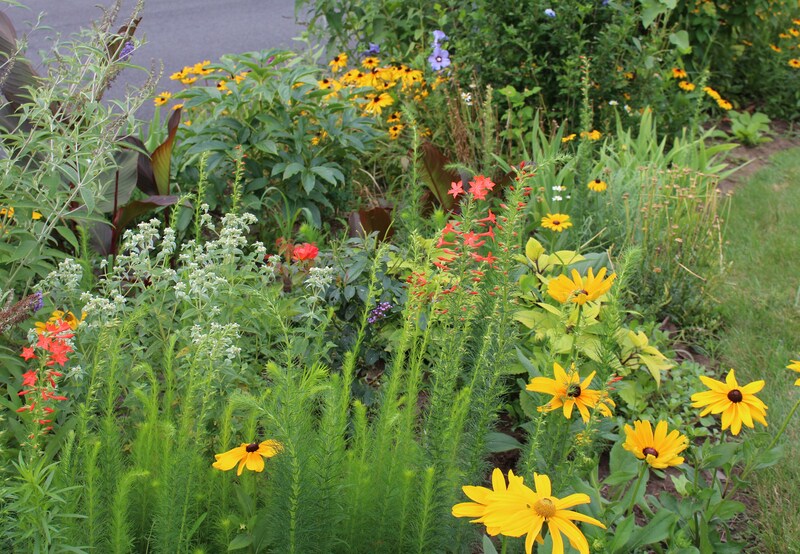 This entry was posted in garden, garden design, perennials, summer, Uncategorized and tagged 'tiger eyes' sumac, arundo donax variegata, black eyed susans, flowers, gold foliage plants, growing garlic, ipomopsis rubra standing cypress, isla gold tansy, overwintered gladiolus, rebar arbor, sunflowers. I love yellow, one of my favorite colors in the garden. Oh good, I never want to be the only one. Come to think of it I like a house painted yellow too, it’s a cheery color all around and kind of makes the yellow haters look a little suspect… how can you hate the color of happy faces? Oh I would love some! I owe you some plants too. I could send you some lilies in the fall? I love your rebar arbor. 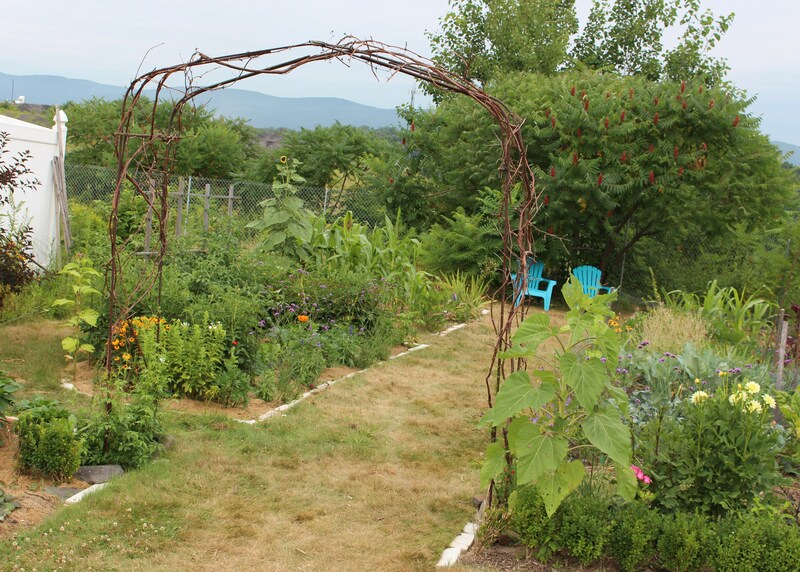 I use construction materials often for trellises and whatnot all over the garden, or at least I used to. I would bring the stuff home from construction sites and then just make something from the reuse of the scrap I found. You did a nice job. 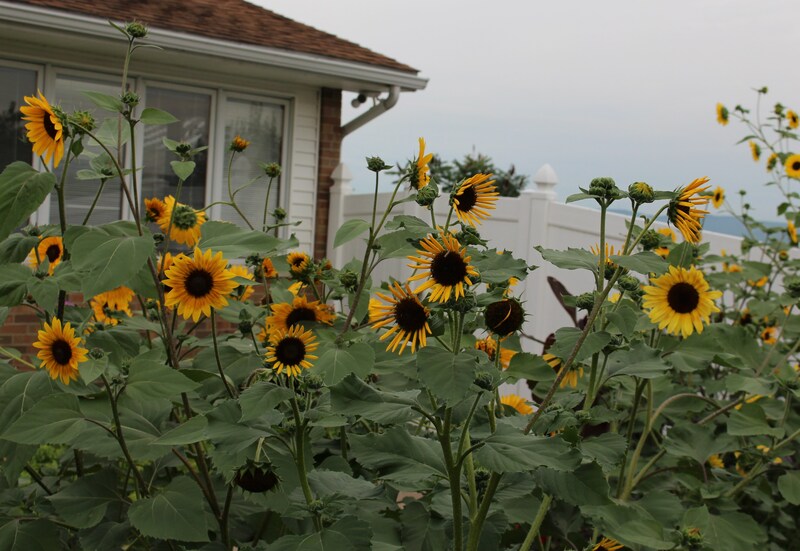 Your sunflowers are wonderful too. I wish I had the space you have for your “farm”. First to go was my vegetable plot. Not only does the vegetable plot take up a lot of room, it’s soooo much work. If it weren’t for the kids I know some things such as sweet corn would be strictly farm stand buys, and I wouldn’t bother. I don’t think a cute little white arbor would fit in well around here. I like the construction look! Your garden tours almost always give me ideas. What I wish was that I were brave enough to go to demolition sites, that’s where all the really good stuff comes from. I’ve been watching them tear down an old bank… all those bricks, the stones, the columns, the stone ornaments. I could have filled my entire yard! I think gladioli are much more tolerant of cold than any book ever suggests, I always left them in the ground on my allotment in England and they returned every year. Everything else is looking great Frank, I especially like your arch in the first picture. Thanks, I’m glad you like the arch, I do too but need to keep my fingers crossed that it holds up! This winter I may try a few glads outside on purpose and see how they do. They can’t be any worse off than if I dig them and then forget to replant again come spring! I love the way there are so many different areas to your garden Frank, and you keep surprising me with another different bed full of great plants – I do like your taste! I think even the bright and cheerful front street border looks lovely! Verbene bonariensis is wonderful wherever you put it (or in my garden it puts itself) and I love the way it complements the gladioli and the phlox…. my colour planning is non-existent, so when something like that happens by chance I find it all the more satisfying! i also like that dark red sedum. They are such valuable plants I must plant one or two more this autum and will look out for that one. I’ve been trying to create different areas but it does take a while until some kind of separation grows up. I think this might be the first year that some of my little cuttings and mailordered starts are beginning to have some mass to them. I do like bright and colorful though… sometimes it seems to work out, other times… well, it comes under the heading of experimental! So many nice plants and plant grouping Frank. I like that quilled sunflower quite a bit. It’s always nice to have something new and unexpected surprise you in the garden, I think that’s why I love annuals. I am intrigued by your Ipomopsis, I have never seen it before, it looks lovely with the Rudbeckia. 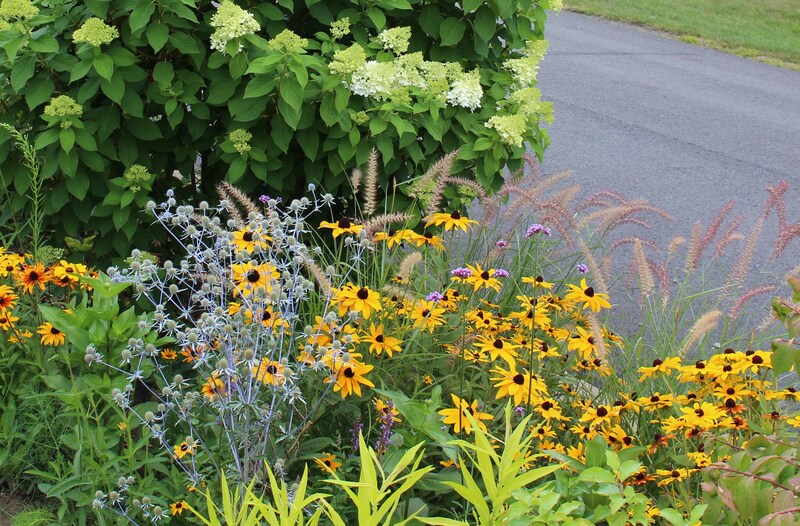 I also love the Pennisetum growing with the rudbeckia, eryngium and hydrangea. Very classy. You have so much looking good in your garden Frank. You must be pleased. The quilled sunflowers are great, they look like a child’ s drawing of a flower. You have put that picture of your amazing Arundo donax there to taunt me, haven’ t you? I am never showing mine again, in fact I think I shall just go and dig it up. I’m sorry Chloris! I did put the arundo in there for you but only to taunt a little bit, it’s so rare that something seems happier here in my hot-cold, dry-soaking, garden! 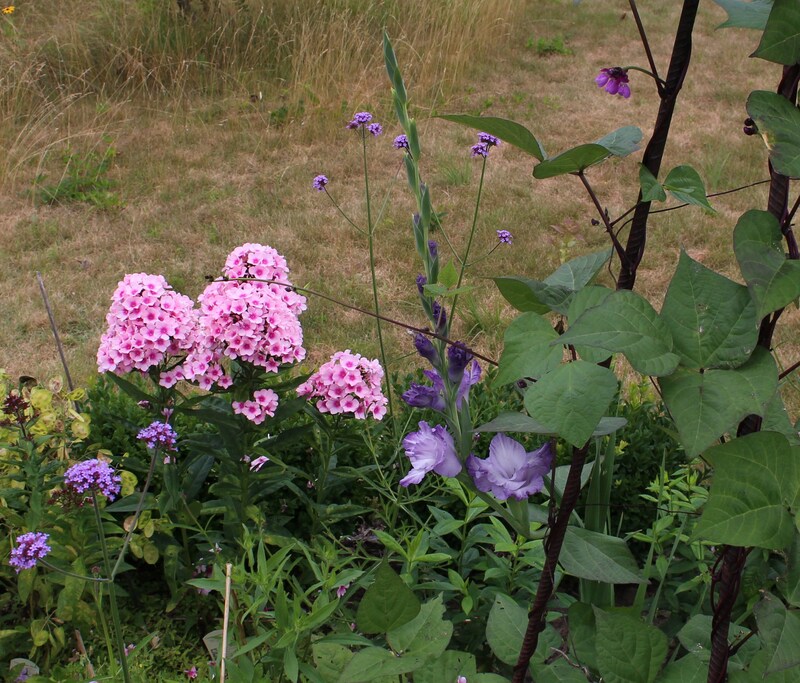 If it’s any consolation I have another clump of a newer cultivar that refuses to grow more than two stalks a year…. I do like the red ipomopsis with the yellow of the rudbeckia. This is the first year it’s grown well for me, all from one small clump of seedlings which sowed themselves far and wide. The color is just as bold as I like them. I don’t know if I’ve ever considered rudbeckia classy, but I’ll take it! They’re not as pretty or subtle or scented as old roses, but the grouping does shout summer and the bright color holds up well to the sun and shows up well enough against a dried out landscape.. I love combining wisteria and sweet corn! Didn’t the Native Americans do something like that? I hear some tribes preferred clematis and pachysandra. I love the combination of flowers and veggies. Actually in Millennium Park in Chicago this year Christy Webber planted edible gardens featuring cherry tomatoes, corn, oregano, cilantro, amaranthus and other things. I am tempted to expand my tiny tomato plot next year and take advantage of the sunshine. Those two will be worth it if they do sneak in. Our best squash happened one year when they just appeared on their own and scrambled up a nearby spruce. By autumn the tree was decorated with golden spaghetti squash ornaments, it was quite the funny sight!